3) And shocker: more alleged corruption on the Texas border — cartels holding political fundraisers. [El Paso Times] More headlines after the jump. 6) Denver pot critic William Breathes calls out Southern California's HempCon for being sexist morons. 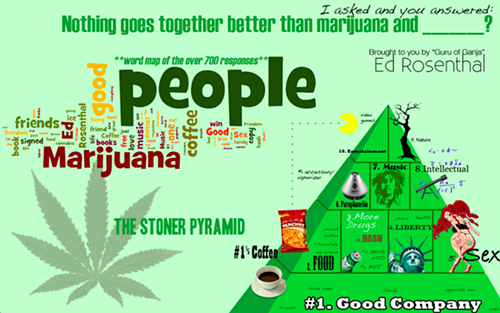 7) Nothing Goes Together Better Than Marijuana and _______ by Ed Rosenthal, with infographic. 11) The speaker lineup has now been announced for Cartographie Psychedelica, MAPS' 25th anniversary conference and celebration from December 8-12 in Oakland, California. Tickets are available now. 12) Berkeley IP law firm Cobalt Academy hosts a workshop on intellectual property rights in medical marijuana October 5th from 1-5 p.m. No charge. 13) The Green Door in San Francisco has a new app. It's so-so.